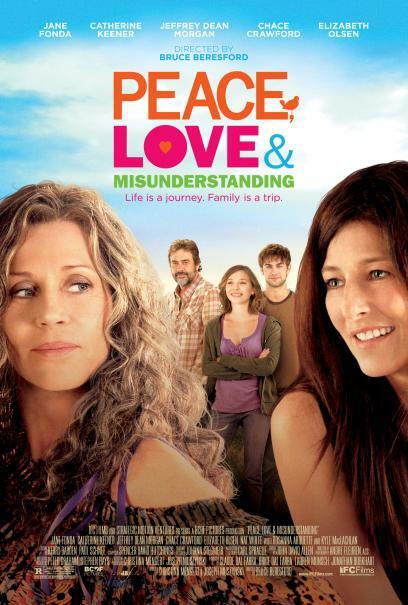 Can PEACE, LOVE & MISUNDERSTANDING really be the third semi-major motion picture in the span of a year in which the answers to all life's problems can be found in half-baked hippie wisdom? Evidently so. Once again, as in last August's OUR IDIOT BROTHER and this year's JEFF, WHO LIVES AT HOME, said wisdom is provided by a family member who is regarded as something of a black sheep for their pot smoking, peace-and-loving ways. The twist on the doobie in this case is that the black sheep is the family matriarch, Grace (Jane Fonda). Grace's daughter Diane (Katherine Keener) is the antithesis of her mom, an uptight, conservative lawyer. The two haven't spoken since Diane had her mom arrested for selling pot at her wedding, which means Grace has never even seen her teenage grandkids Zoe (Elisabeth Olsen) and Jake (Nat Wolf). When her husband (Kyle MacLachlan in a small role) says he wants a divorce, however, Diane decides to take the kids and head off for a family reunion at Grace's farmhouse in Woodstock (where else). It's all pretty much what you would expect – Diane criticizes her mom and tries to get her to tone down her behavior, even though she's just dropped in completely unannounced and uninvited. Grace spouts woo-woo nonsense about prophetic dreams and crystals and gets her grandkids high on pot, and of course offers words of wisdom that help everyone with their love lives and personal issues. Characters are drawn broadly, with Diane every bit as stereotypical as Grace, but thanks to the solid performances (is Keener ever bad in anything?) they feel more real than they have a right to. There is no doubt that what happened in the sixties made a huge impact on American culture, whether you feel that impact was for the better or the worse. Regardless, you don't move forward by going back. And yet this film seems to be saying that love generation nostalgia is a cure-all for modern ills. That's just as ridiculous a stance to take as the right wingers who want to turn the clock back to the fifties. Oh, there's a throwaway line where Grace says maybe she has made some mistakes, but the way the movie presents her and her lifestyle, whatever mistakes she made are minor at most. None of which is to say PEACE, LOVE & MISUNDERSTANDING isn't an enjoyable film. Director Bruce Beresford (BREAKER MORANT, DRIVING MISS DAISY) is a seasoned filmmaker, more focused on storytelling and performance than style, and he seems to have a genuine affection for this material. While one couldn't exactly label this film as confrontational, the casting of “Hanoi Jane” alone pretty much insures that those on the right of the political spectrum aren't going to find much here that speaks to them. As a lightweight family comedy for the more liberal leaning families out there, however, there's probably enough warmth and humor here to justify a trip to the theater. 2 1/2 out of 4 stars.